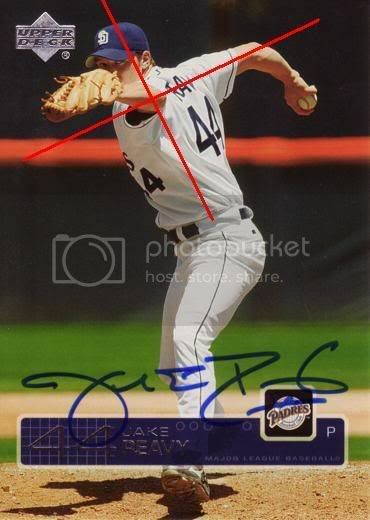 I was wondering what everyone here thought about jake Peavy’s mechanics. Personally, I really like how he drives toward the batter and really pulls his front side in. Would he be a good pitcher to watch, mechanics wise, besides the fact that, as seen in the third picture, his elbow gets pretty high, though not as high as, say Anthony Reyes? Hmm. Did you happen to read Chris O’Leary’s blog today? I did too. Just as Chris pointed out, I don’t like how he straightens his front leg. As far as his elbow is concerned, in the third pic you posted, his elbow is above the shoulders in relation to the ground, but it is actually level with his shoulders. His body is tilted forward towards 3B. Look at the red lines I drew. That is how to determine whether the elbow is above or below. It really doesn’t make sense to look at a particular pitcher’s mechanics in their entirety because the total deal is probably tied closely to that pitcher’s physiology. Instead, I think it would be better to look at those aspects that pitcher has in common with other top pitchers. Those commonalities are probably the things you stand a better chance of successfully incorporating into your own delivery. But this is easier said than done.